The 1940 Ford Coupe is a legend among hot rodders and classic car enthusiasts and it’s being reborn by Ford. 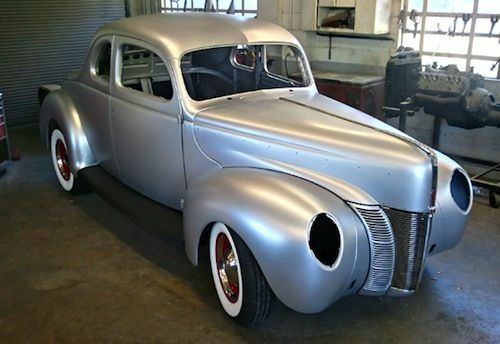 The 1937-1940 generation of Ford Coupes is one of the most popular cars that hot rodders and classic car enthusiasts can get their hands on to restore. It’s classic body style is the perfect platform for building a custom hot rod with a V8 engine and modern chassis. The 1940 Ford coupe is a true legend and was also used by early stock car racers and formed the basis for the first dirt track racing. But more recently the car is sought after by hot rodders and is an icon in custom car circles. Classic car enthusiasts everywhere can rejoice because Ford has announced they will be bringing back the 1940 Ford Coupe to life. Ford Restoration Parts will be offering a new reproduction 1940 Ford Coupe steel body shell using high-strength steel and modern welding techniques. Ford will also make the 1940 Coupe body available with a modified recessed firewall so restorers can update the iconic coupe with a more powerful custom powertrain. The new body will also come rustproofed from the factory and ready to be built as a full custom or as an original classic car. Most if not all 1937-1940 Ford Coupes are all but gone out of junk yards and have been snatched up and either restored or customized. This give classic car enthusiasts a whole new avenue to express their creative talents. The new reprooduction body will give restorers a “blank canvas” in which to work. The project isn’t new for Ford as they have made reproduction bodies of the 1965-1970 Ford Mustang for years. Ford will be unveiling the new 40 Coupe body at the upcoming SEMA Show in Las Vegas and will also display a fully customized 1940 Ford coupe hot rod. Ford used the reproduction body for the build to show what can be done with the new bare body shell. The customized SEMA Show car will be powered by a new 5.0-liter V8 engine, four-speed automatic transmission and Mustang II front suspension. And as many hot rodders will do to the 1940 Ford, the roof has also been chopped and lowered. See the 1940 Ford Coupe Reproduction video here.